The aging hardware for the hard-drive based iPod classic and the screen-less iPod shuffle were not updated Tuesday, and the devices were not mentioned by Apple during the company's keynote. But the devices were listed at the tail-end of a press release issued by the company, revealing that they will continue to remain available —at least through the holidays. "iPod is the world's most popular family of music players," the press release reads. "Apple's holiday lineup includes iPod shuffle for just $49, iPod nano with Multi-Touch starting at just $129, iPod touch available in black or white, including iOS 5 and iCloud, starting at just $199, and iPod classic in a 160GB model for $249." The prices for the iPod shuffle and iPod classic remain unchanged. That's unlike the iPod nano and iPod touch, both of which were given minor updates with slightly lower prices. A week ago, a rumor suggested that Apple would discontinue both the iPod shuffle and the iPod classic, as sales of the company's portable media players continue to dwindle as consumers gravitate toward multi-purpose devices like the iPhone. But during Tuesday's presentation, Apple said that the iPod is still a strong market for the company, with nearly half of iPod purchases coming from someone who has never owned an iPod before. More evidence to suggest the end of the iPod classic was discovered by AppleInsider last week, when it was noted that Apple removed its selection of click-wheel games for the classic from iTunes. Though they live on, Apple continues to de-emphasize the iPod shuffle and, in particular, the iPod classic as part of the iPod family. In addition to not being mentioned during Tuesday's keynote, the iPod classic is not pictured in a press image provided by Apple. 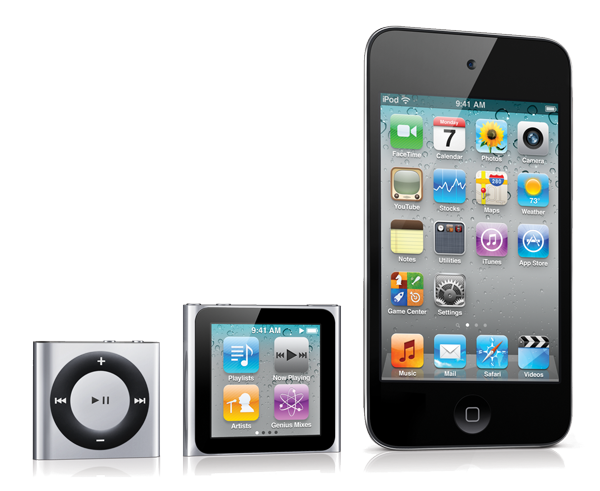 That image (shown above), only shows the iPod touch, iPod nano and iPod shuffle.